She was chosen by Grosso and his group to become the Overlord. She has great battle prowess, especially with a spear. Hailing from a very discipline-centric family, she lives by the orders that are given to her by her master. On the other hand, she doesn't really have a will of her own, so she never acts of her own accord. The Krichevskoy Group thought they could use her character traits to their advantage. However... They seem to have some trouble with her order-following ways, as well. 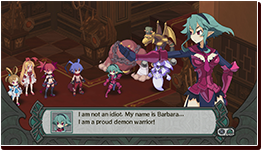 One demon stands in the way of Laharl and company, as a candidate for Overlord. Her name is Barbara. 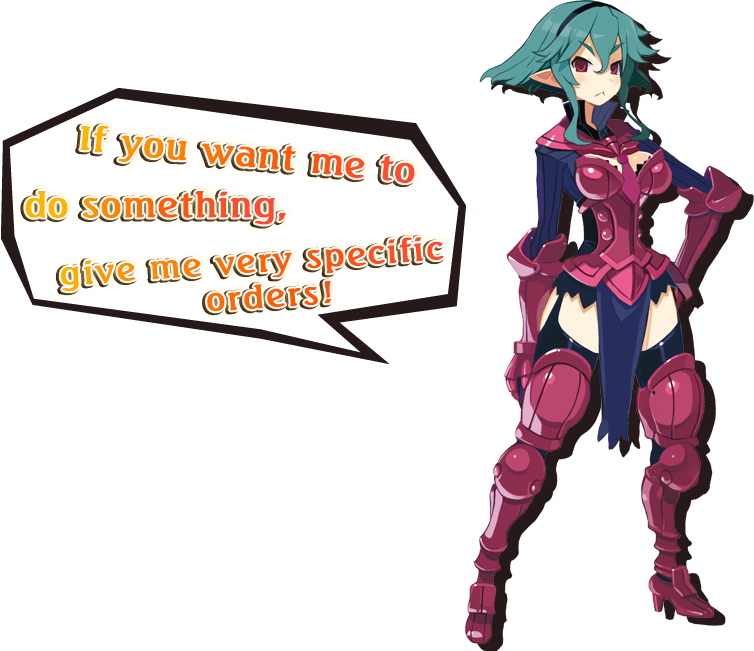 She has a character trait where she will only follow her orders, and won't even fight unless ordered to do so... On the other hand, her fighting skills are Overlord caliber. Here is one of her skills. Barbara's Unique Skill "Order: Chaos Dance" Sword, spear, bow, axe—! She can summon and equip many kinds of weapons, and her skill allows her to do just that. She slams a number of weapons into her enemies. Each of her attacks deal immense damage, and those who feel the impact of this skill aren't even left with the strength to stand. Barbara's special skill, "Order: Chaos Dance"! This is the skill of a candidate for Overlord!